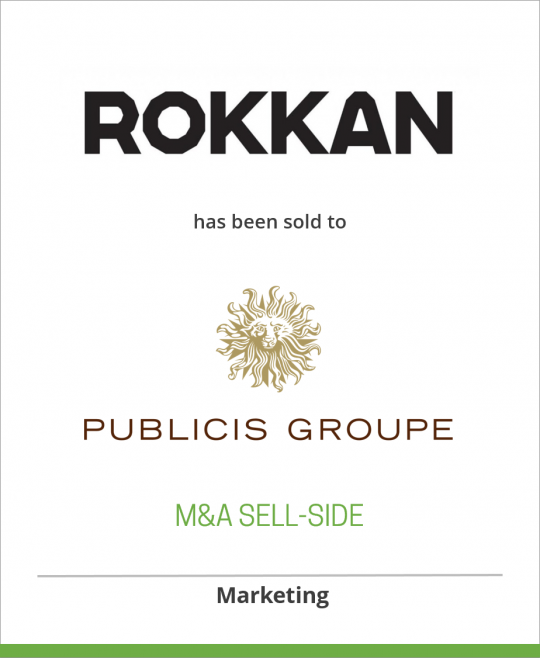 Publicis Groupe [Euronext Paris: FR0000130577] today announced the acquisition of 100% of ROKKAN Media LLC, a full- service digital agency in New York that works with top global brands. The move follows Publicis Groupe’s acquisition of luxury advertising agency AR New York on December 4, and that of Outside Line on December 13, highlighting the Groupe’s strong commitment to both growth within the US market and the rapidly growing digital sector. Founded in 2000, ROKKAN — which borrows its name from the Japanese word for intuition or “sixth sense” — focuses its expertise on creating innovative campaigns with strong cross-platform appeal in e-commerce, loyalty programs, digital marketing, mobile and social media. ROKKAN’s core services include Strategy & Planning, User Experience, Visual Design, Technology, 3D and Motion Graphics, Marketing, Game/App Development and Emerging Media. Over the past 12 years, work by the agency’s 70 New York-based employees has won nearly 100 awards from global communications events, including the Cannes Lions, Communication Arts and The Webby Awards. Advertising Age also named ROKKAN among its top ten Agencies to Watch in 2012. Working seamlessly with its clients’ teams to create fresh and personalized campaigns, ROKKAN serves a growing list of top brands including JetBlue Airways (aviation), Nestlé Purina PetCare, Sharp Electronics, Bethesda (gaming), Chipotle Mexican Grill (restaurant chain), Caesars Entertainment (hotels and casinos), Dish Network (satellite broadcasting), and Stolichnaya Vodka. ROKKAN will operate as an autonomous unit within Publicis Groupe, and its co-founders — CEO John Noe, Chief Experience Officer Chung Ng, and Chief Creative Officer Charles Bae — will continue to lead the agency. The US advertising market is slated for growth of 4.3% in 2012, 3.5% in 2013, followed by 4.4% in 2014, and 4.7% in 2015, according to ZenithOptimedia’s latest forecasts (December 2012). Internet adspend in the United States is forecast to grow at a rate of 18.2% in 2012, 18.1% in 2013, 18.3% in 2014, and 17.6% in 2015. Publicis Groupe revenue derived from digital in the US has reached nearly 50%. ROKKAN is an independently owned digital agency reinventing the way brands interact and engage with their consumers. Borrowing its name from the Japanese word for intuition, ROKKAN continues to impact the digital space, delivering digital solutions, turnkey campaigns, and social engagements for some of the largest brands in the world. Founded in 2000, ROKKAN has grown from a three-person startup into a full-service agency housing some of the most innovative talent in the industry. With a nimble approach combining strategic consulting, social media, user experience architecture, design, and technology, ROKKAN’s not your ordinary digital agency. Find us on Facebook, tweet at @ROKKANmedia, or learn more on LinkedIn. Publicis Groupe [Euronext Paris FR0000130577, part of the CAC 40 index] is the third largest communications group in the world, offering the full range of services and skills: digital (Digitas, Razorfish, Rosetta, VivaKi), traditional advertising (BBH, Leo Burnett, Publicis Worldwide, Saatchi & Saatchi), public affairs, corporate communications and events (MSLGROUP), media buying and strategy (Starcom MediaVest Group and ZenithOptimedia) and specialized communications with PHCG (Publicis Healthcare Communications Group). Present in 104 countries, the Groupe employs 56,000 professionals.